UFC On FOX 2 goes down this weekend, but the promotion are already looking to put together the fight card for the next show on the network which takes place on May 5th. 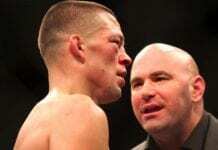 As such Dana White has announced that a lightweight fight between two of the division’s top contenders Nate Diaz and Jim Miller will feature on the main card. It’s a fight we suggested on https://mmainsight.com in an article following Miller’s ‘UFC On FX1’ victory over Melvin Guillard on Friday night and it should be a cracker. Diaz has looked great since returning to the lightweight class following a stint at 170lbs, producing big wins over Takanori Gomi and Donald Cerrone. Meanwhile, Miller got back to winning ways with a quick submission against Guillard after a blip at the tail end of last year when he lost to Ben Henderson. A highly impressive 10-2 record overall in the UFC means that a win over Diaz could secure him a long awaited title shot. Between them the two men have six ‘Fight Of The Night’ and six ‘Submission Of The Night’ awards so you’re almost guaranteed an entertaining fight here between these two well rounded and extremely durable competitors. Reports are also coming in that a flyweight bout between recent TUF winner John Dodson and Darren Uyenoyama is also being lined up for the show, though it’s more likely to get a slot in the preliminaries rather than the FOX aired main card.